These beautiful children attend Thomasville City Schools. They come from a variety of backgrounds and home situations. Some return home each evening to the same comfortable bed; others do not. Many families are coping with poor conditions brought forth by a struggling economy. We do not live in a vacuum, and what affects one child, impacts us all. In these faces are infinite possibilities. We, at Memorial United Methodist Church, invite you to make an immediate difference in the lives of our displaced children. 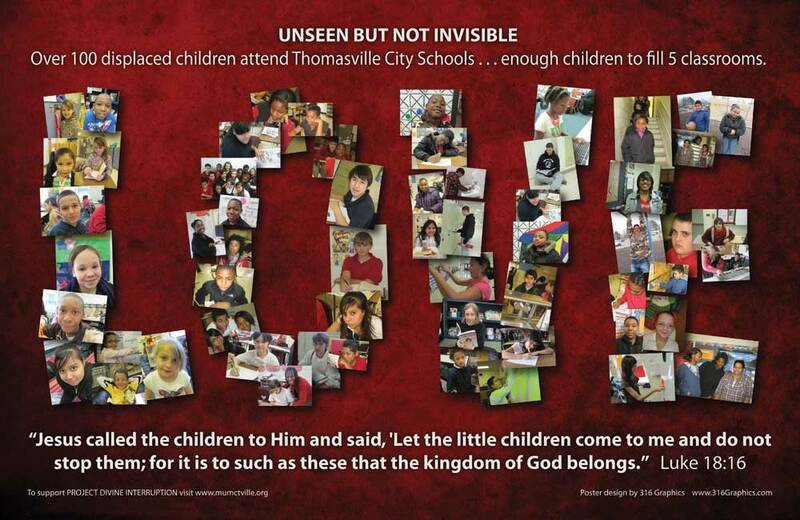 When you purchase a poster for $10, all proceeds go to a specific fund at Thomasville City Schools to help meet the basic needs of these students and their families. Through “Project Divine Interruption”, we are taking a stand that poverty will not have the last word! For more information or to purchase a poster, please stop by the church office (336) 472-7718 or contact Tracy Brinkley. Please make all checks payable to: “Memorial UMC” please include “Project Divine Interruption” notated in the memo portion of the check to insure proper allocation.